Growing up, Julie Bitton’s heritage was always an important part of her life. With her father hailing from Marrakech, aspects of Sephardic and Moroccan culture were constantly surrounding her, and after a Paris engagement last fall to Dr. Thomas Price, Julie immediately knew that she wanted to incorporate traditions of her Moroccan lineage into her wedding. 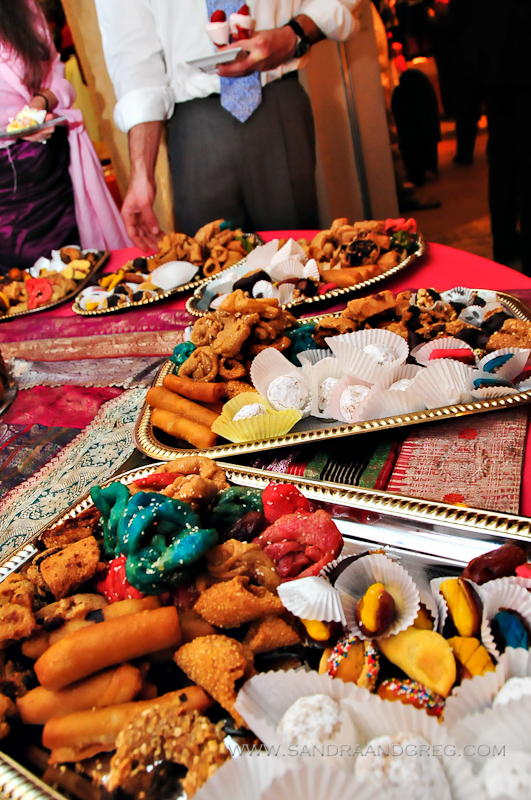 Customarily, Moroccan wedding celebrations last much longer than the standard American ceremony and reception. In the week leading up to the nuptials, family and friends of the bride and groom gather, throwing parties to celebrate the union. The family of the groom sends the bride gifts, everything from perfume to jewelry, as part of a tradition that stems from the arranged marriages of the past. The festivities also include a trip to the mikvah for the bride and a henna party a few days before the ceremony. For Julie, embracing the rituals of her Moroccan heritage was very important, but she also wanted to make her wedding true to herself and Tom. As much as the celebrations the week leading up to a traditional Moroccan wedding resonated with her, the logistics of being able to share that much time with family and friends was unrealistic. In compromise, she decided that she would take the most accessible of the traditions and incorporate them into her reception. She also chose a location that gave a truly authentic feel to the entire event and served traditional food at the reception. While there are plenty of amazing venues in Atlanta, none conveys a true Sephardic vibe quite like Congregation Or VeShalom. Between the gorgeous rotunda and the eye-catching sanctuary boasting stained glass and a central bima, Julie and Tom knew that this was the perfect place to exchange their vows. And with the help of event designer Andy Beach, they were able to transform the social hall into a Moroccan reception, complete with lanterns, flowers and decorative tile centerpieces. Julie also wanted to include her favorite pre-wedding custom into the reception – the henna party. Traditionally, the henna party occurs a few days before the wedding and involves painting a reddish-brown dye on the hands of the bride; the drawings can range from intricate to a single large dot and symbolize health, wealth and fertility. In homage to her culture, Julie held a small version of the henna party during the second portion of her reception. A large dot was painted on both Julie and Tom’s hands then covered and tied with a ribbon to allow it to soak in. The color stays on their hands for up to two weeks, and according to Moroccan folklore, the bride is exempt of her domestic duties until the henna disappears. After changing into traditional Moroccan kaftans and jellaba (the long white robe predominantly worn by men), Julie and Tom joined their families for dancing and, of course, traditional Moroccan food. With a menu provided by Ran Dori of OU for U in Sandy Springs, guests were able to sample authentic fare like Moroccan cigars (a crispy pastry stuffed with spicy meat), couscous and plenty of hummus. And for dessert, Ran provided specialty Moroccan cookies covered in nuts and honey. While Julie did incorporate non-Moroccan customs into her celebration, the importance of honoring her heritage was clear. With less than 2,000 Jews still living in Morocco today, remembering where she came from was crucial, and she believes more people should acknowledge in their important celebrations.